Watermelon is by far one of the most beneficial body-healing fruits. The health benefits of watermelon cover everything from brain function to the cells in your feet. Watermelon is incredibly hydrating (up to 92% water!) and is naturally low-fat. Benefits include improving cardiovascular health, nourishing your eyes and revving up your immune system. We are entering summer, the best time to indulge in this juicy melon that delivers an array of nutrients, vitamin and minerals. The lycopene in watermelon is especially important for cardiovascular health and is now being recognized as an important factor in promoting bone health. 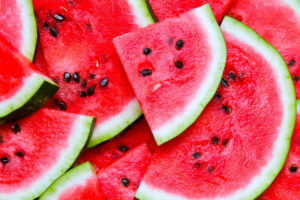 Consuming watermelon has also been correlated with improved cardiovascular function because it improves blood flow via vasodilation (relaxation of blood pressure) and is rich in potassium which helps to retain calcium in your body, resulting in stronger bones and joints. The citrulline, an essential amino acid, in watermelon has been shown to reduce the accumulation of fat in our fat cells. Citrulline has the ability to (through a series of steps) block the activity of TNAP (tissue-nonspecific alkaline phosphatase) which makes our fat cells create less fat, and thus helps prevent over-accumulation of body fat. Watermelon is rich in the compounds that reduce inflammation and neutralize free radicals. Make sure you pick ripe watermelons because they contain higher amounts of these beneficial compounds. Watermelon is a natural diuretic which helps increase the flow of urine, but does not strain the kidneys (unlike alcohol and caffeine). Watermelon helps the liver process ammonia (waste from protein digestion) which eases strain on the kidneys while getting rid of excess fluids. Rich in potassium, watermelon is a great natural electrolyte and helps regulate the action of nerves and muscles in the body. Potassium determines the degree and frequency with which our muscles contract, and controls the excitation of nerves in our body. Watermelons have an alkaline-forming effect in the body when fully ripe. Eating lots of alkaline-forming foods (fresh, ripe, fruit and vegetables) can help reduce the risk of developing disease and illness caused by a high-acid diet (namely, meat, eggs and dairy). The vitamin C content in watermelon is astoundingly high. Vitamin C improves our immune system, helps heal wounds and has been observed in numerous studies because it is essential to the formation of new connective tissue. The enzymes involved in forming collagen (the main component of wound healing) cannot function without vitamin C. If you are suffering from any slow-healing wounds, up your intake of vitamin C heavy fruit.